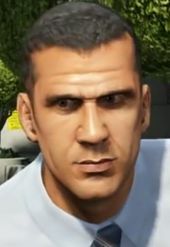 Andreas Sanchez is a character in the HD Universe who appears as a supporting character in Grand Theft Auto V. He is voiced by Abdel Gonzalez. Andreas Sanchez is an IAA agent based in Los Santos who works with or under the United Liberty Paper Contact. By 2013 he is working undercover at the FIB under celebrated agents Steve Haines and Dave Norton. The IAA correctly suspect that the two are corrupt with Sanchez gathering information to expose them. Sanchez is present when Norton introduces Michael De Santa to Agent Haines with Michael being asked to kidnap Ferdinand Kerimov from the IAA Building. Later on, he collects the money stolen from the Blaine County Savings Bank in Paleto Bay. After gathering enough evidence, he and the IAA attempt to apprehend agents Haines and Norton while they meet with Michael at the Kortz Center with Sanchez revealing his true motives. When Haines is shot in the leg by another IAA agent, he responds by killing Sanchez with a bullet to the head. After escaping the IAA and subsequent Merryweather ambushes, Norton tells Michael that he will lay the blame for the events on Sanchez. This page was last modified on 22 May 2015, at 19:57.